Last month I was able to attend an event held by SEGA and play Total War: Warhammer II. During the event we were told about the Skaven, unveilled yesterday as the fourth major race. While there I was also able to have a chat about the game with Andy Hall, lead writer and Greg Alston, Lead animator. You can read about this in my interview piece. In addition to this I got the chance to play as the Skaven for a couple of hours. 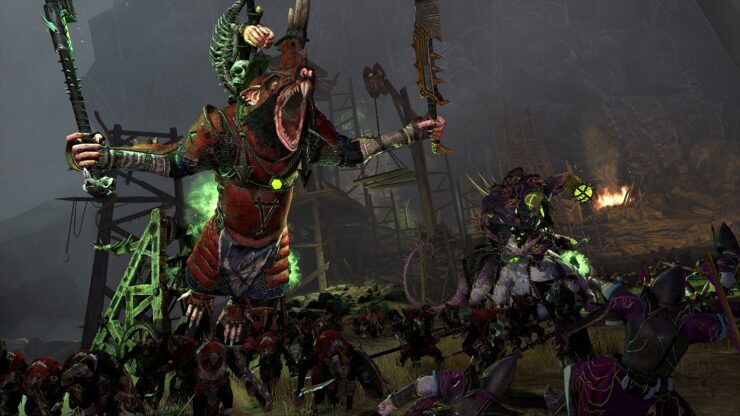 Following on from the success that is Total War: Warhammer (you can read my review here), Warhammer II has moved on from the lighter area of Humans, Dwarves, Vampires and Orcs to an even more fantastical line-up of factions. Introducing rat men and lizard men to the standard Elven varieties, it was time to take the Skaven by the whiskers and conquer what I could of the new world. 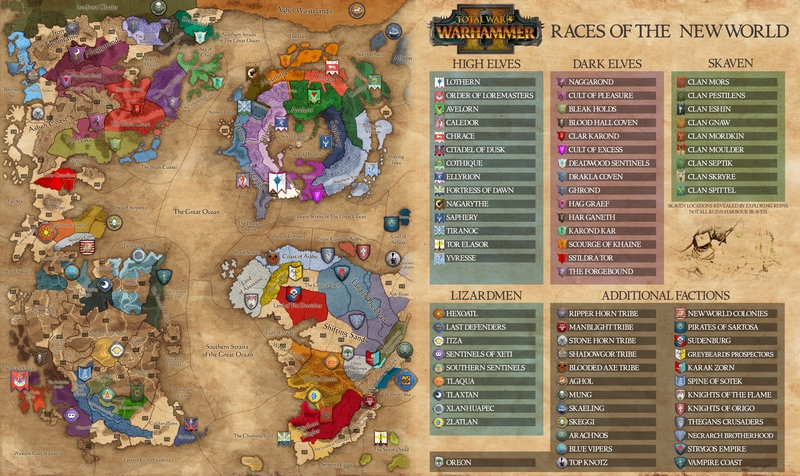 The new campaign map featured in Total War: Warhammer II features a number of large land-masses, all set to the west of the first game. Between these land masses is a huge swathe of ocean. Newly added to the series are points of interest. Shipwrecks, tombs and ruins litter the map. Looting these can offer a nice boost of gold and ritual resources, making them worthwhile additions to the map. Although I didn’t get to experience a number of the new features within the game, I did get to see and hear about them. One example is how the factions in the game have multiple heroes. Your selection of hero will actually determine your starting location within the game. What we do know about the main campaign, Eye of the Vortex, is that it focuses on the previously revealed Great Vortex. Taking on a tighter narrative than previous Total War campaigns, the game will task you to perform a number of rituals to utilise or destabilise the Great Vortex. In addition, the four main factions found within the game each have their own unique currency and gameplay style. What was immediately noticeable for me is just how much personality the races have here. At least, that certainly is the case for the Skaven. The writing, the script, everything played well to the personality of the rats on show. One interesting feature that plays right into the Skaven personality is the loyalty system. Hero’s have a limited loyalty and your actions can either raise or lower them. Winning battles, equipping with items or even outright bribing them can raise their loyalty level. Losing enough will lower it and, lower it enough and you could find yourself with a rogue army on your hands. Skaven Take the New World, Yes-yes! So playing as the Skaven really introduced a number of fantastic features the new race has going for them. They really take the concept of Stealth to the next level, acting unlike anything we’ve seen before in Total War history. One major way this is exemplified is with what is known as the Under-Empire. Skaven settlements are, as one would expect from rodents, beneath the ground. As such, all Skaven settlements are seen as ruins until an enemy attempts to settle or explore the ruins. By then, it’s probably too late. This allows the Skaven to develop huge cities and train huge armies away from the prying eyes of any opposition and can be used to surprise and overwhelm enemies quickly. Skaven tactics at their finest. Following the trend of stealth tactics and use of the underground is an in-battle ability called The Menace Below. This ability summons a unit of Clanrats anywhere on the battlefield, allowing you to raise them behind enemy lines, attacking artillery or ranged units that are otherwise out of reach. It’s also incredibly useful in siege battles, allowing you to pop up and threaten capture points like enemy gates, towers or even the main square of the settlement. The Menace Below does have finite uses per battle. Primarily this is dictated by the level of Skaven corruption in a particular region. The number of uses can also be managed by the use of food, the Skaven’s particular unique resource. Why food? Because rats eat. Huge rat people like the Skaven eat a lot and need huge quantities of food to maintain their enormous numbers. This food can be obtained from battle, raiding enemy territory, sacking their settlements and also specific food generating buildings. In addition to increasing the charges of The Menace Below food can also be used to increase the starting level of a newly occupied settlement as well as providing faction-wide bonuses like an increased growth rate, higher morale and higher levels of public order. Of course, this is Total War so there’s got to be a focus on battle. Skaven are sneaky and few things exemplify this more than their unique stance, Stalk. Stalk gives your rat-based armies a high chance to ambush enemies while moving towards them. Ambushes are needed because the Skaven are weak. Starting units like Clanrats and Skavenslaves are light and cheap, but make up for it with overwhelming numbers. This builds in well to the Under-Empire trait of being able to amass overwhelming numbers in secret. Later units are when their forces really shine. Known for their mad-scientist like creations as well as the sorcery they infuse into their creations lead to monstrous creations. Mechanical contraptions like the Warp Lightning Cannon and Doomwheel as well as horrible creations like the Hell Pit Abomination rain death on the battlefield, making up for any natural weaknesses. Like all other races, these have four unique rites/rituals. 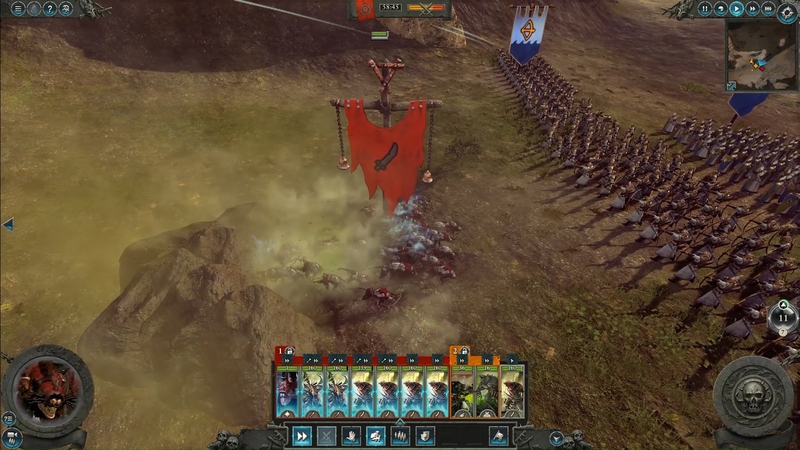 The Skaven rites summon unique hero-type units once completed. A summoned DOOOOM Engineer is effectively a suicide bomber, causing a devastating earthquake at a city. This heavily damages buildings and reduces the city’s settlement level. The Pestilent Scheme Priest spreads a plague in enemy territory. In the affected regions, the plague causes attrition and other negative effects. It can also be caught by armies in the region and spread to other regions they travel to. Even having only played two and a half hours, I can already tell that Total War: Warhammer II is great. Of course it wasn’t enough time to explore all of the changes brought into the new release, but that only adds onto the joys of experiencing the game in the full release. September 28th can’t come sooner. Removing the weaknesses of the initial release like only allowing races to capture specific settlements is a sound move. It allows the game to expand its scope, particularly in the grand campaign. This will only be expanded shortly after release as the expanded map is patched in. 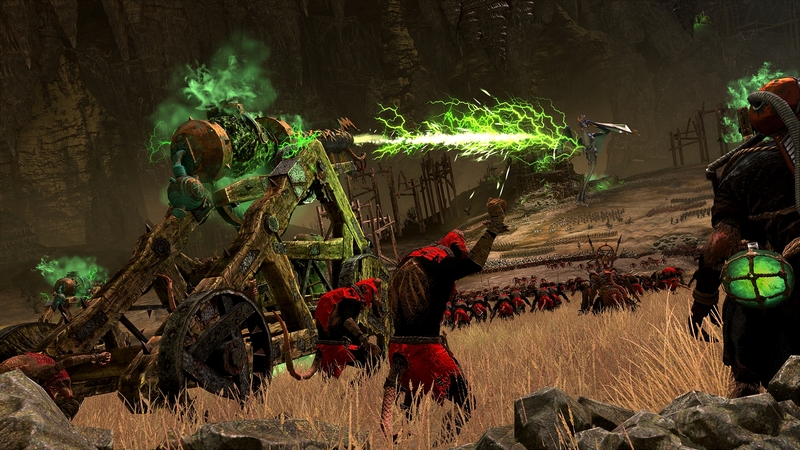 Bringing together the maps of both Total War: Warhammer games will make for a huge grand campaign. At the same time they’ve brought in a tight narrative to the Eye of the Vortex campaign and, as mentioned in the interview, will end with shocks, surprises and an epic end battle.